I have a little trouble with pimatic and hope one of you can help me out. Pimatic works but I can’t get a send and receive signal over 433mhz? is this correct and how do I declare it in homeduino? Like this or? Or is this completely wrong and did i just blew up my gpio? Also is there an howto on how to install switches with 433mhz? It appears in the dashboard but as expected it doesn’t work. Which plugins must be installed for this to work? because there are just so many different things, I am a little lost. Really hope one of you guys can help me out here! Did you see the posts in the HowTo section? See 4-homeduino-433-mhz-sending-receiving-and-even-more, in particular. @jordy55 It’s unlikely you blew up the GPIO Don’t worry. It’s not recommended to use direct connection to GPIO, because it will take a huge part of CPU usage when there is no filter/arduino. Expect CPU% load to be 50-80% when using directly from GPIO. RPi pins accordingly are 11 and 16 if I remember correctly. Check the link. WiringPi pins are for sender DATA and receiver DATA connectors. Connect a 17cm dupont cable / 433mhz antenna to sender and receiver. it’s preferred to take away the pin from ANTenna and solder directly to the board, as this will ensure your antenna to be 17cm exact, not 17cm+pin lenght. Plug GND and VCC how you like to GPIO, you can solder the cables together (VCC+VCC, GND+GND) if you want to save pins for something else, or want to reduce amount of cables if you use a breadboard. At this point you don’t need to have a switch in pimatic config. Start Pimatic, select Messages from Pimatic GUI. select Debug from dropdown 1, pimatic-homeduino from dropdown 2. After this, you should start seeing RF waves that are recognized (press a button on 433 switch to see it ) If it is a supported switch, it will show both the RAW RF data and the Protocol it translates it to (example: switch1, device id: 1, unit: 1, value/something else: up/down) these are the information you want to list to config as the new device. If you don’t see any data, something else is going on… I recommend using an arduino clone solution, as it will take away the CPU load, you don’t have to use GPIO from the Pi, and you can easily place the arduino to a better place using a longer USB cable (better reception). Please tell how it goes! Thanks guys for your fast answers! Yes I’ve seen the post but I was worried if i blew up my GPIO pins haha. I will give it a try tonight with changing the transmitter and reciever to 0 and 1 in the script and i will also add a antenna. I will let you know how it goes! Hope it works because it’s a nice addition to my house. If you have connected the receiver via 3.3V as shown in the picture there should be no issues. The transmitter can run at 5V without problems as the data out is from Raspi and the input line of the transmitter can deal with the lower voltage. It is said the sensitivity of the receiver is better at 5V. If the reception is bad you may want to try the wiring with the level converter - or even better, use an Arduino to offload the signal (and noise) processing as the load will be high as @kitsunen pointed out. Here’s one big difference to the Arduino wiring : the receiver will be connected to 3.3V!! It is very important, since the Raspberry Pi can only handle 3.3V on the GPIO pins. 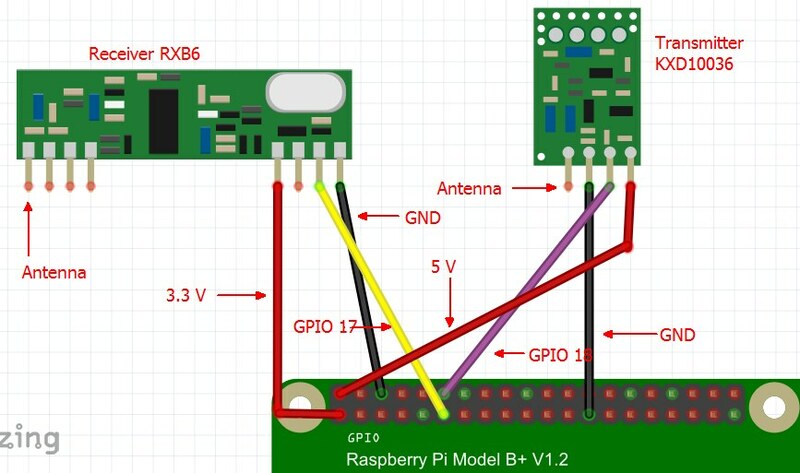 The Raspberry has a 5V out but when you connect the receiver’s VCC to 5V, the level of the data pin will be 5V too an this kills the GPIO of the Pi! I don’t know whether or not this is true, as I used to run my RF receiver and sender through 5V line when I didn’t have an arduino, two years ago or so. I didn’t have anything break. In fact, the same RPi has served me for 3 years or more… 4 maybe. Okay guys it works! My receiver is hooked up to 5V and the GPIO pins are still working so. I have also add a antenna to both the receiver and transmitter but the range of the receiver is not quite well. Can I not make the antenna longer or does this has a negative influence on the reception. Tonight I am gonna place my raspberry from the bedroom to the attic therefrom. I also have an electric heater with a power plug, I wanted to automate this by means of a temperature sensor and a relay if you understand me. Are there wireless temperature sensors for available? I only work now with the Dutch product KAKU (Klik Aan Klik Uit) but I would like to expand further. 17cm - 17,3cm are the general antenna lenghts. Either via a single straight wire, or a helical antenna (google helical 433mhz antenna). In RF technology is not the frequency signed, it is the the wave length. 433MHz is equal to 70cm Wave length. What kind of a receiver are you using? The recommended receiver is RXB6 model. I get around 10 meters minimum range on active switches. With contact sensors (no battery) and wall switches (no battery) I get around 5 meter range. These are quite bad, and should be considered a “minimum working range”. My antenna isn’t properly cut, I’m waiting for more helical antennas. There are countless wireless RF temperature sensors. Some are supported by pimatic (Kaku has some if i remember right), some are not, but most of the unsupported ones just mean they are not yet added to a protocol. This can be fixed. Try to search the forums a bit, we have quite a lot information here. And of course pimatic documentation, too (main website). hello people I spent a little time with pimatic but now i ran into a problem, I use this receiver module but if hook up the receiver and transmitter i don’t receive any signals but if I only hook up the reciever and not the transmitter then i receive everything also if the transmitter is hooked up i can’t transmit any signals with my remote. As if the transmitter constantly emits a signal which interferes with the receiver and remote control. Is this a known problem and is there a solution for this? Would like to hear it from you guys! did you check your wiring? about your hardware I cannot say anything since the receiver/transmitter is unknown to me. but at our receiver hardware tip we recommend to use the 3400RF kit with RXB6 receiver. This hardware has been tested by many users and is supported by pimatic without issues. Yes my wiring is oke but i find it very strange that my remote control also doesn’t work sometimes if my transmitter is hooked up? is it emitting a signal or something, is there a way to check it? What kind of remote do you use? An IR remote won’t be interfered by RF signals. But if you use a RF remote it could be that a defective transmitter “fires” weird signals and disturbes RF traffic. I am using the remote of Kaku the APA3-1500R. But what is even weirder that if I disconnect the transmitter everything works fine also receiving signals on my raspberry pi but if I hook up the transmitter nothing works only sending signals from my raspberry pi as if the transmitter has a kind of force majeure? guess you should buy a new one and try. But I find it strange that the receiver alone works fine and the transmitter also. I will have another look at it, the transmitter and reveiver both use the same power source could this be a problem?